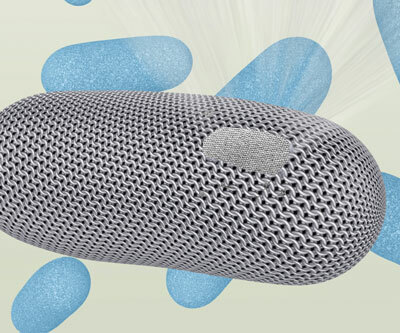 (Nanowerk News) Imagine thousands of copies of a single protein organizing into a coat of chainmail armor that protects the wearer from harsh and ever-changing environmental conditions. That is the case for many microorganisms. In a new study, researchers with the U.S. Department of Energy (DOE)'s Lawrence Berkeley National Laboratory (Berkeley Lab) have uncovered key details in this natural process that can be used for the self-assembly of nanomaterials into complex two- and three-dimensional structures. Details on this study have been published in the journal ACS Nano ("Ion-Specific Control of the Self-Assembly Dynamics of a Nanostructured Protein Lattice"). The binding of calcium ions to SbpA proteins starts the process by which the SbpA self-assembles into nanosheets. Ca2+ binds to SbpA with an affinity of 67 µM. Given the rugged nature of the S-layer proteins and their adhesive quality - bacteria use their S-layer armor to attach themselves to their surroundings - there are many intriguing applications awaiting further study.